The only thing brighter than Mohinder Bir Singh’s multi-coloured scarf was the smile on his face as he was so much excited after he cast his ballot at a Polling Station in Grassfiled, Lumley on March 7, 2018. According to Singh, Managing Director of Jeety Trading Company, it was a moment that was particularly special to him as an India-born citizen who gained Sierra Leone citizenship through naturalisation. 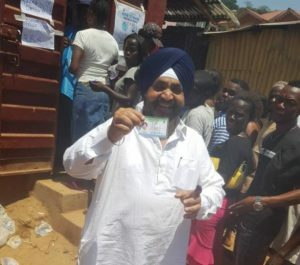 Singh, commonly known Jetty, is the only Indian who has been naturalised as citizen of Sierra Leone that voted in the crucial election in the Western Area Urban. He is a big business entrepreneur in the country and employs over 500 Sierra Leoneans. He also sponsors more than 200 students by providing them with scholarship. The Indian business tycoon is currently embarking on the construction of schools and other development projects in the country. Mohinder Bir Singh expressed his gratitude to exercise his right to vote in Sierra Leone and called on all Sierra Leoneans to keep the peace and accept the outcome of the results that would be announced by the National Electoral Commission – the only body that has the authority to release the final result of the election. He assured Sierra Leoneans that he will continue to contribute to the development of the country and called on the business community to continue providing their unflinching support to whoever becomes President of the country. He described the electoral process as ‘free, fair without any intimidation’ and commended the people for voting peacefully.